China is one of the fastest developing nations in the world. Many people considered one of the main factors of this development as passion for education. China has a lot of universities and Tsinghua University (THU) is the most famous. The university has nurtured many global talents and they have contributed to China’s development in a variety of fields. It can sometimes be difficult to prepare for going to another university as an exchange student. Bae Eun-jin, who major in public information of speech, is a senior student at THU. She has spent three years in China so she has a lot of information to deliver to UOS students. Her advice for students at the University of Seoul (UOS) would be useful if they are preparing for attending a Chinese university. 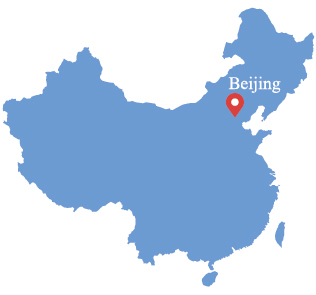 THU is located in Beijing, the capital of China. This university is known as one of the top universities in China, along with Peking University. 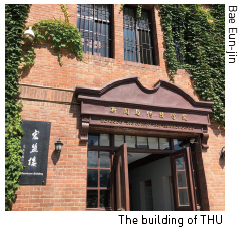 THU is a national-established, so the Chinese government has operated this university. THU was established in Beijing, China on April 29, 1911. When the Boxer Rebellion, which was uprising of anti-imperialist against foreign influence in China, arose, a foreign alliance including the United States suppressed the revolt. The ruling of Qing dynasty was required to pay indemnities to alliance members. After a lot of negotiation with the ambassador of Qing dynasty, the United States decided to reduce indemnity payment on the condition that the funds would be used as scholarships for Chinese students to study in the United States. As a result, the Tsinghua school was established by using this fund. “The dormitories at THU are very old,” she said. “It is better not to hope to have new rooms. The room that I live in is very small. The size of the room does not matter to me but the bathroom is totally small. It is sometimes uncomfortable when you take a shower.” She recommended that exchange students should live in a private dormitory if they want to stay in the newest buildings and rooms. “The prices in China are lower than those in Korea, but THU applies higher prices on dormitories to foreign students. This is unfair, but I do not have any choice. The appearance of the dormitory buildings is beautiful,” she said. Chinese weather varies because the country is very large. 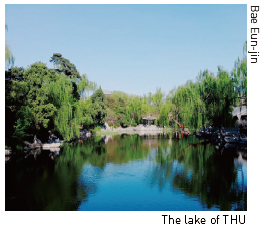 THU is located in Beijing so it has a continental climate, a wide annual temperature range, and a small amount of rainfall. Bae said, “the weather in Beijing is similar to the weather in Korea. However, the weather in Beijing is very dry, so it is not as uncomfortable or humid as that in Korea.” China, including Beijing, is also notorious for yellow dust. “Until last year, I never saw a blue sky. There was always a yellow or grey sky because of the yellow dust. For that reason, the Chinese government has implemented environmental policies in an effort to make the country green. These policies have brought back blue skies to Beijing. Nowadays, I always see a blue sky there,” she said. For reference, a Chinese environmental policy, called the Nongnyong policy, replaces coal with gas and moves chemical plants out of the main Chinese cities. “I do not feel uncomfortable because of the weather in Beijing. Rather, it is better than that in Korea,” she said. “I usually eat at Korean restaurants because the food in THU is a little greasy,” Bae said. “I have spent three years in China so I sometimes miss Korean food a lot. Most exchange students only stay for a while or one year, so they have passion to experience Chinese food,” she said. She recommended a variety of kinds of Chinese food to eat. Like Korea, China has a lot of street food to enjoy. For example, Marachwal is three or four pieces of fish cake or octopus’ egg balls pinned to a long wooden stick. She sometimes hangs out with her friends to enjoy Marachwal. “It goes well with in harmony with beer. 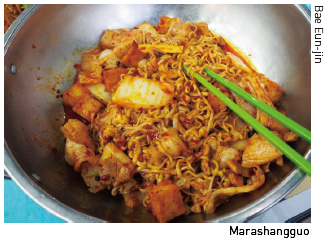 You can easily picture it if you know the Korean fish cake, Eomuk.” She also described Marashangguo, which is a kind of fried Chinese-style noodles with vegetables and seafood. “It is similar to the Chinese food called jjamppong, but it is not a soup. Marashangguo is also popular in Korea, so Korean exchange students enjoy it when they come back to Korea,” she said. “Besides street food, THU operates their own restaurant for students. The menu changes every day and the food is very cheap and delicious,” she said. “Activities are not that different from Korea but it is too far to enjoy Chinese culture because the continent is too vast,” Bae said. “We can go to karaoke room or enjoy street food. Exchange students want to experience a variety of cultures as much as possible so they try to go far away. It is also good to see many historic sites, like the Great Wall or the Mausoleum of the First Qin Emperor,” she explained. She also described Odogu, which is a street that has many shopping centers. The street is like Hongdae in Korea, so a lot of students hang out or go shopping in Odogu. “If students do not want to go far, I totally recommnend Odogu. It takes about 30 minutes to go there and they can buy souvenirs. It is a Chinese street but you feel like you are in a familiar place because Odogu is very similar to Hongdae,” she said. “There are far fewer things to prepare in order to become an exchange student at THU than compared to other universities, such as those in Europe. Korean students also have an opportunity to get used to Chinese culture, which is very similar to Korean culture,” Bae said. “The local time in Beijing is only an hour different from Seoul and Beijing so you can still easily communicate with family members,” she added.